If you’re looking for a way to kick of your Fourth Of July holiday this coming weekend, you need look no further than what may be Philadelphia’s finest rock and roll venue, Johnny Brenda’s. In one of the truly must see shows of the weekend, Bag Of Songs favorites, In Grenada & New Motels take the stage along with the the highly raved about Busses. 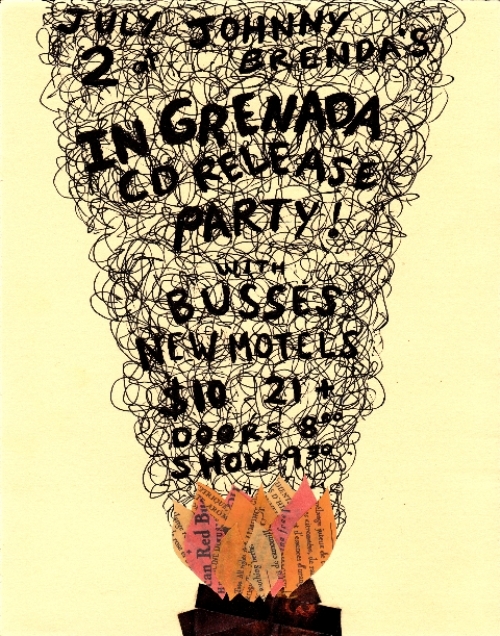 All three bands have new cds hot off the press, with this Friday’s show being the official release party for In Grenada‘s Break. A majestic,spiritual record that is among the year’s best. Busses, described on their Philly Weekly Music Guide page as “An organic mixture of ’60s singer-songwriters, ’80s post punk and drunk-in-the-basement ’90s indie rock” just unleashed their self titled disc in early June, while New Motels recently delivered their own gem in Tilbury Sweat, picking up where the brilliant power pop of their Domestic Life EP left off and upping the ante for another classic. A night of rock and roll fireworks you don’t want to miss, see you there.